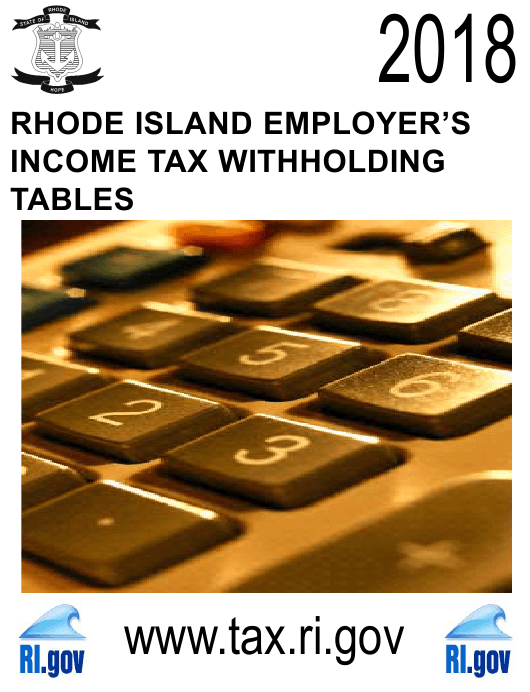 Form RI W-4 is a Rhode Island Department of Revenue form also known as the "Rhode Island Employer's Income Tax Withholding Tables". The latest edition of the form was released in July 10, 2017 and is available for digital filing. Download an up-to-date Form RI W-4 in PDF-format down below or look it up on the Rhode Island Department of Revenue Forms website. filed on or before the last day of the following month. January 31st or at the termination of business. course, please write directly to the Division of Taxation - One Capitol Hill - Providence, Rhode Island 02908-5800. (2) Any part of the wages were for services performed in Rhode Island. for the last preceding payroll period and withhold the remaining tax from the supplemental wage payment. Rhode Island withholding for employees, the employer may rely on federal withholding exemption certificates (Federal Form W-4). taxes being withheld from his pay. a daily return to a less frequent basis will be permitted only at the beginning of a calendar year. within three banking days after the last day of the quarter-monthly period. employer must begin to file quarter-monthly in accordance with the instructions above. exceeds $50 the employer must begin to file monthly or quarter-monthly as required by the instructions above. essary adjustment on a subsequent withholding return. or a form which has been approved by the Division of Taxation. Island tax withheld on all Forms W-2 furnished to employees. wages (see part 4 for details). The Supplemental withholding rate is 5.99%. information regarding convenience withholding may be requested from the Division. Rhode Island Division of Taxation - One Capitol Hill - Providence, RI 02908-5800.